Helping clients SIMPLIFY and ORGANIZE their home spaces by taking control of chaos and opening the pathway to harmonious living. Are you ready for a stress-free way of life? 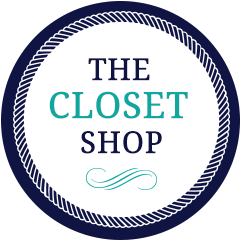 The Closet Shop helps clients organize their home with our unique, closet and storage systems. Our products are high-end, but low cost, and are masterfully crafted. We'll organize your bedroom and linen closets, pantries, laundry rooms, garages, offices and basements at the best price and service. Find out how we can help with a FREE in-home estimate of our custom wire and laminated closet systems by calling 215.205.1130. We are located in Doylestown of beautiful Bucks County, Pennsylvania (PA) but our service area extends to Montgomery County, Philadelphia and suburbs, Allentown, Easton to Princeton, New Jersey (NJ).